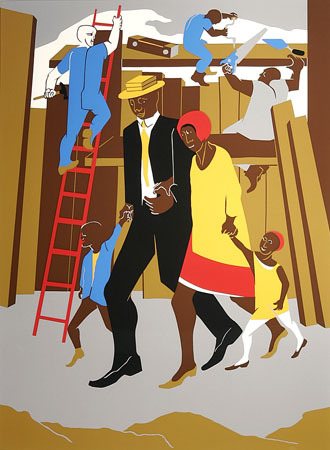 Jacob Lawrence (1917 – 2000) was born in Atlantic City, NJ and moved with his family to New York City in his early teens. School nurtured his artist talent but it was life amid the Harlem Renaissance, a period of intense African-American creativity and cultural revival centered in Northern Manhattan, that really inspired him. Through a series of critically acclaimed solo exhibits, Lawrence gained fame in the 1930s and ’40s for his depictions of African-American history and struggles. At 53, he took at position as an art professor at the University of Washington. (It was actually in Seattle that I first encountered Lawrence’s work.) He had a long, prolific artistic career and demonstrated a deep commitment to teaching and mentorship. 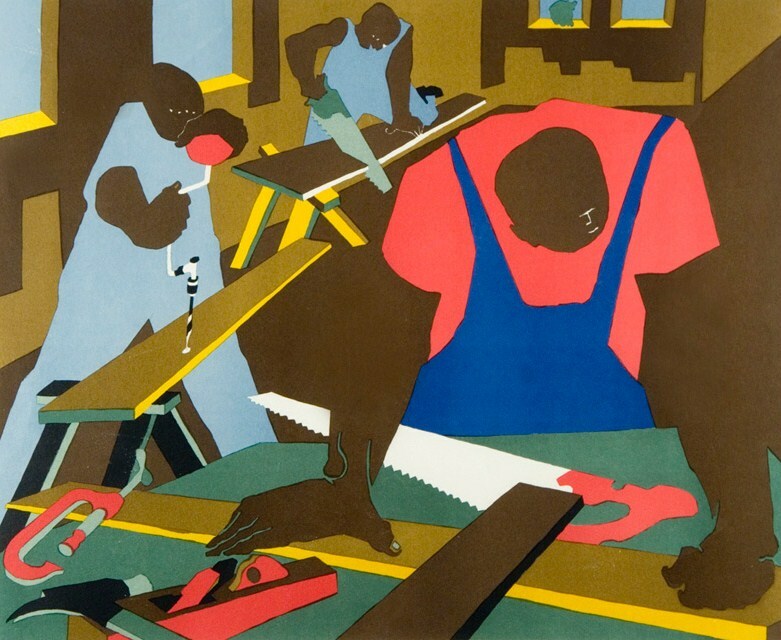 To me, Jacob Lawrence has a thoroughly modern style. He painted primarily in tempera which gives a matte boldness to his pieces. His palette is very colorful and delineated, usually consisting of huge contrasting areas of color. His style reminds me of the cubists in that the figures occupy both a tilted, flat world with the occasional, incongruous element of perspective. While far from naturalistic, his paintings convey a great deal of emotion and narrative and call the viewer to reflect on issues of social justice. 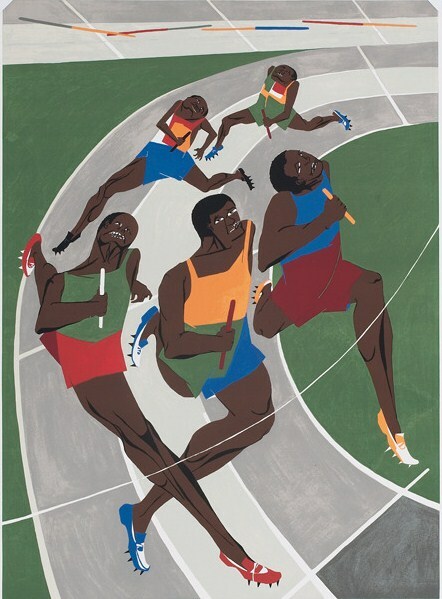 I think Jacob Lawrence’s style is very captivating and I cannot avoid being drawn in by the expressive, daring palette. 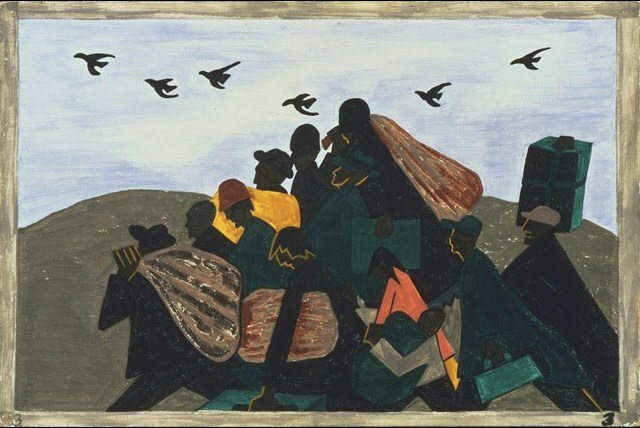 Jacob Lawrence is most know for the 60 piece collection now known as “The Migration Series.” These 60 panels document the mass immigration of African-Americans from the South to Northern urban centers such as Chicago and New York in the 1920 and ’30s. Seeking better employment opportunities and struggling to make a new life for themselves, Lawrence’s paintings highlight a significant but often forgotten period of American cultural history. 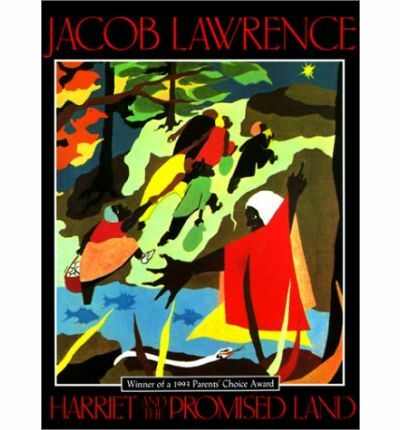 In 1968, Lawrence published the children’s book “Harriet and the Promised Land”. The book combines a powerful narrative poem with a series of painting completed from to 1939-1940. The book is gorgeous and perhaps one of the easiest ways to add a little art to your collection or your coffee table! Works by Jacob Lawrence can be seen at most major American art museums. The Whitney Museum of American Art in New York City, the Seattle Art Museum, and the Phillips Collection in DC which exhibits the Migration Series. What powerful, graphic work. I’m impressed that Jacob Lawrence maintained such consistent style and quality from his early days right up to 1993. And I’m fascinated by the fact that he was born in Atlantic City, one of my favorite places. Great post. Thanks Lesley! It is bit of a change to see someone with a strong and consistent artistic vision who spent their career focusing on the subject matter of the work. Wow, his style reminds me of Matisse but executed in a more dynamic way. I love that he found his style and stuck with it rather than following trends. Extraordinary work, so vibrant and fun! I love the fact how he preserved history in his Migration series and especially love the Panel 3 image above. Although abstract, he invites you in for a glimpse of life’s struggles and victories, love the Olympic piece. Nicely done Christina!